Building your own tiny house is a big step into a small world. Once you make that decision, you’ll realize that you have more big decisions ahead. Are you handy enough to build your own home from tiny house building plans? Should you hire someone to come in and build your tiny home? Or, do you go the DIY route and buy a kit that you put together yourself? Each one of these choices has its specific advantages and drawbacks, which is why it’s so important to do your research and figure out which of these options is best for your particular situation before joining the tiny house movement. In this post, we’ll review the pros and cons of building a tiny home yourself based on building plans, hiring someone to construct your home or using a DIY kit. One of the popular ways to construct a tiny home is to use building plans. In this scenario, you’ll need at least a basic level of proficiency in construction, both in building the frame of the house and doing plumbing, electrical and roofing. With these basics in mind, let’s take a look at some actual tiny house plans that you can use to build your own tiny home. We examined plans provided by Alaska resident and tiny home builder Ana White, who, along with her husband, built a 200-square-foot home that’s 26 feet long and fits on an 8-foot-wide trailer. Her website provides free, downloadable plans for the home. The plans we looked at were 20 pages long and included specs for building the home’s shell, which does not include cabinets, furniture, and other add-ons that you bring into the home when the shell is done. These plans are representative of what you’ll often see when you download free plans, some of which will include tiny home floor plans, too. You’ll have multiple pages detailing all the measurements of the home’s frame, as well as small tips here and there about how to make the right cuts and where to leave gaps and space for upcoming steps in the building process. All of these factors are important, if for no other reason than you’re spending a considerable amount of time, money and energy on the project and you don’t want to waste any resources on bad plans or a tiny house that doesn’t meet local building codes. White brings up a good point. 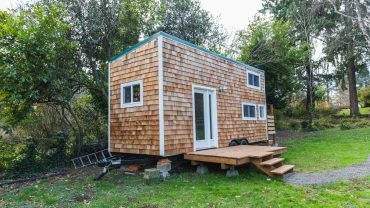 When you’re building your tiny home, you should always consult an architect or engineer, especially if you’re pulling free downloadable plans off the internet. Doing so will ensure that the plans are solid and that your house won’t fall apart as soon as the last nail is in. Also, keep in mind that, whether you build from plans or you hire a builder, you’ll need to consider local codes and requirements for your project. In most cases, you won’t need a building permit if your home is less than 200 square feet. However, it’s always a good idea to head to the American Tiny Home Association’s state regulations page to double check. Other considerations for using plans are that you’ll have to purchase your own wood and supplies and you’ll need a relatively strong set of tools that will help you finish the job. One of the drawbacks of building a tiny home form blueprints or building plans is that you have to go out and purchase all the materials you’ll need to build the home. In most cases, you’ll also have to install your home’s electrical box and all the “chases” through which the wires in your home will run. Each one of these steps in your home-building process requires, as we mentioned earlier, a certain level of skill. DIY kits tend to simplify all of that by doing some of the electrical work and most of the framing ahead of time. Livable Pods and DIY Pods are two excellent examples of websites where you can buy pre-fabricated components that require far less labor on your part than building a tiny home from plans. The two sites are indicative of the varying levels of sophistication you can get with pre-fabricated tiny homes. Regardless of how simple or complex your kit is, it typically comes with a formidable list of “ingredients” included in your shipment. What you’ll notice here is that you’ll still be building from plans, but those plans won’t be nearly as extensive as what you’d get when you do a from-scratch project. It can be easy to slip into a mindset in which you think that permits and other local requirements aren’t necessary for a pre-fab tiny home. As Livable Pods points out, that’s just not the case. 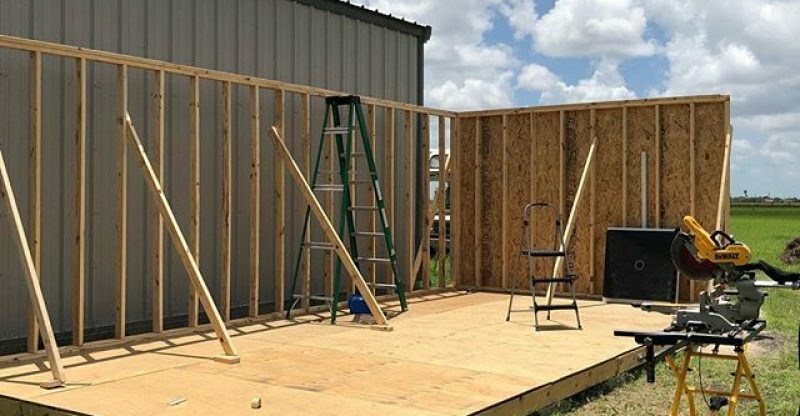 Whenever you’re building a structure – pre-fab or not – you need to be aware of the laws, regulations and restrictions in the area where you plan to build. For example, there’s a good chance you’ll have to order a soil test if you’re building a house on top of a concrete slab. These tests are important because they help you understand how to build your concrete base in light of the soils’ ability to support the weight of the slab and your home. Livable Pods also notes they can, for a fee, help you through the permit process and make sure everything is up to code based on your local laws. This is a key feature of a DIY-lit company’s services, especially if you’re a newcomer to building codes. Don’t forget to check the American Tiny House Association’s state regulations page to understand which, if any, permits and tests you’ll need. The final option you have for building a tiny house is hiring someone to do it for you. This option is definitely a good choice if you don’t’ have any building experience and lack the tools necessary to put a home together. In the end, it will cost you more but the headaches you save from the problems and quirks that inevitably will pop up during a DIY project could be worth the higher price tag. The key to this choice is determining who the reliable builders are. Check with other tiny house owners to find out who they used and/or recommend, as they’re often the best source of information for reliable contractors. Another option is to get advice from a tiny house trade organization like the Small House Society, whose Designers and Builders page provides designers and builders from coast to coast as well as in Canada. One of the biggest differences in the three options we’ve presented for building a tiny house is price. As you can see, having a builder construct your tiny home is going to be the most expensive option. Pad Tiny Homes points out that the $50K-$100K price range is what it will cost to hire a reputable builder. First-time tiny house builders will cost you less but there’s a good chance that mistakes and misjudgments will occur, something you typically don’t have to worry about with an experienced builder. The various price ranges in the table aren’t exact numbers; there are times that you’ll find cheaper and more expensive options within the three categories we showed. One of the ways that your price will increase is by adding customizations either through a builder or on your own. If you have the ability to do so, get quotes from three different builders in your area to get a sense of what the price range is and what each builder offers or doesn’t offer compared to the other companies you got quotes from. Much of how you decide how you want your tiny house built depends on your skill level as a builder and your budget. 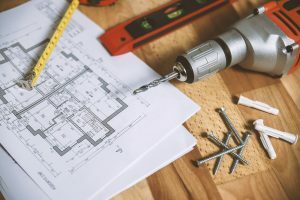 If you find yourself without the ability to build a home from scratch but skilled enough for basic carpentry and other tasks, then there’s a good chance that buying a DIY kit is the best fit for you. 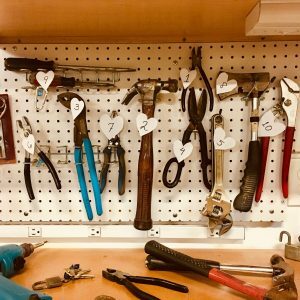 These kits don’t require a ton of handiwork and are, for the most part, ready to be put together with a few basic tools. If you’ve got the experience to build a home from scratch, then building from plans would be an excellent choice not only because you can pick your own materials, but also because you have the option to use plans as a starting point and add your own customizations along the way. Should you find yourself without any type of construction ability, then you’ll want to start comparing prices of DIY kits and builders in your area. If you have the financial resources, then going with an experienced builder would be ideal. Also, keep in mind that experienced tiny house contractors will be able to help you with unique add-ons and nuances that a DIY kit can’t provide. If you would like to learn more about tiny houses, feel free to check out our article which covers everything you need to know about tiny houses HERE. lovely tips! I must try all these.